If you think some things are too hard to measure, or if your business colleagues find measurement nearly impossible on some of the things they care most about, Douglas Hubbard’s book will open your eyes to more creative ways of tackling measurement challenges. 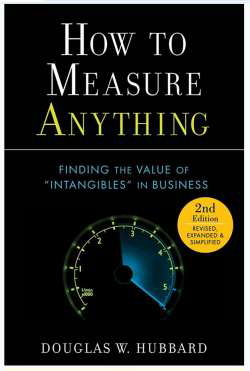 Although this is a business book based around dealing with measurement challenges in a business context, the measurement principles he espouses are broadly applicable. It is not hard to think of applications in the sciences (of course) but equally in the arts. Basically any situation in which something has to be measured, ranked or compared as a platform for decisions is amenable to the measurement methods explained herein. Douglas invented Applied Information Economics, a measurement method that has proven useful supporting tricky decisions in IT, R&D and other situations. Douglas also wrote The Failure of Risk Management: Why it’s Broken and How to Fix It, which perhaps explains why there is a light sprinkling of risk management measurement examples in the present text. Information security/risk management professionals will feel right at home. Douglas’ core thesis is that, if you currently have no meaningful measures of something, then almost any observation of it probably counts as a worthwhile measurement since it provides additional information based (more or less) on fact. Just because an observation might be subjective and vague does not necessarily mean it is worthless. We might not be able to elaborate on why the Mona Lisa is such an iconic image in precise, scientific terms but that widely held subjective perception is certainly enough to account for a large part of its market value. To be frank, it’s hard to think of any substantive weaknesses in the book, except maybe for one issue stemming from my own peculiar bias. While I accept Douglas’ premise that observers can be taught to moderate their own biases (to some extent, anyway) in order to make their measurements more objective and accurate, I found the repeated references to ‘observer calibration’ a little distracting. Reading between the lines, it sounds as if Douglas sells ‘observer calibration’ courses. That said, Douglas outlines the process dropping big hints about how the calibration occurs, so this is at worst a soft-sell. This book will cost you 30-odd dollars from Amazon. If you are anything like me, you will be thinking of real-world applications within the first few chapters, re-framing your own approach to measurement, and starting to make use of the measurement concepts before you finish reading it. Since very few business decisions would not be improved by better information, the book should pay for itself in a few hours and from there on it’s all gravy. Get it. Read it. Contemplate it. Put it into action and pass it on.